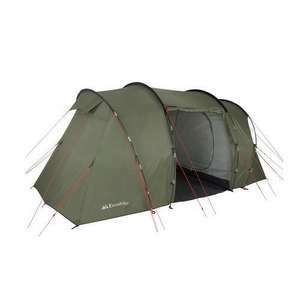 A comfortable camping experience comes easily with this Cairngorm 4 Man Tent from Eurohike. Pitching extremely easily, you will be camping in comfort in a matter of minutes. Accommodating up to four people with 2 compartments and a 2 door entry system, the spacious design of the Cairngorm Tent makes it ideal for family or small group camping trips. Ideal for camping trips across Europe in all seasons, the Cairngorm features a hydrostatic head of 2000mm, providing waterproofing to the tent that is more than equipped to handle the wet weather that you are likely to experience should you find yourself holidaying in Northern France, Germany or just about anywhere across the UK. A comfortable camping trip will come easily too. The Eurohike Cairngorm Tent features colour coded tent poles that show you exactly where each pole and tab goes, making pitching quick, easy and headache-free! And outer tent pitching first, means pitching in unpredictable weather won’t be a problem, as the outer tent gets erected first, the inner tent will be kept dry should the weather turn wet! Fibreglass poles make the tent lightweight without compromising on durability. There's 6% Quidco and a 20% off voucher too for Millets. These were £70 for large parts of last year - agree they hike the price to make the sale price look good. Also makes a nonesense of the reviews for other tents, when you've no idea how much they paid for it.